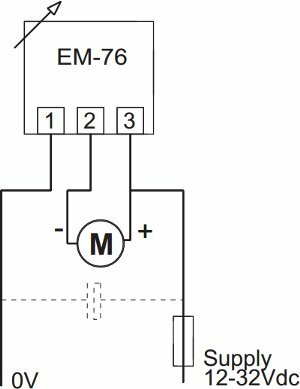 The EM-76 is a panel mounted power controller for DC motors up to 100 Watts with a supply voltage of 12-24 Vdc. In order to achieve high efficiency the PWM principle is used. A suitable supply voltage is filtered DC and where the ripple is less than 20%. If the supply cable is longer than five meters a capacitor close to the regulator is recommended.